TV-B-Gone Jacket « Adafruit Industries – Makers, hackers, artists, designers and engineers! Whenever I bring my TV-B-Gone out to restaurants, I look suspicious pointing it around. So I embedded the device into a jacket and turned it into a wearable TV silencer. For the switch, I sewed paths of conductive thread that become bridged by the metal zipper pull when it passes by. At the restaurant or bar, all I have to do is unzip my jacket to turn off the TV(s). The TV-B-Gone kit is what you need! This ultra-high-power, open source kit version of the popular TV-B-Gone is fun to make and even more fun to use. This version can be used in both “North American/Asia” as well as “Europe/UK” areas (basically, the whole world)! This kit comes unassembled with all parts necessary. Tools and batteries are not included. 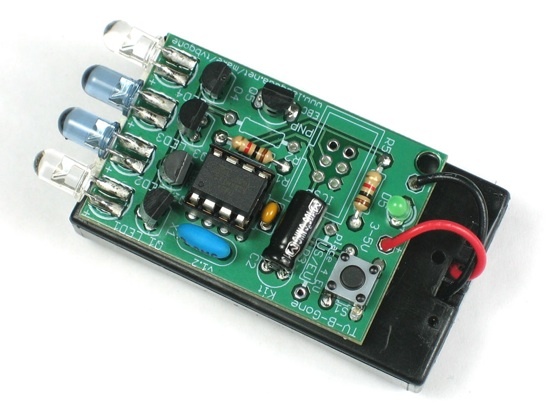 This is a very simple kit and great for people who have never soldered anything before. Tired of all those LCD TVs everywhere? Want a break from advertisements while you’re trying to eat? Want to zap screens from across the street? This turns off (or on) most TVs in the world! Number of TV power codes: 230 total, 115 each for American/Asian and European! You can select which zone you want during kit assembly. Max distance: v1.2 has double the power, goes 150 ft or more! Get one at the Adafruit store! Lastly, be sure to check out our design notes – shows how the devices works!